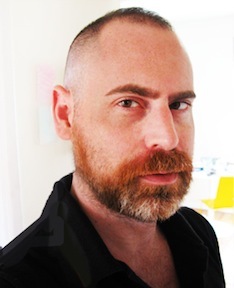 Artist Reed Seifer. Photo by Jennifer Hwa. THIRTEEN recently spoke with New York-based artist Reed Seifer, creator of the optimism MetroCards that launched in 2009 as part of the MTA Arts for Transit program. Here, Seifer discusses his favorite art in the subway and on the streets, and how New Yorkers responded to his art during economic hard times. Treasures of New York: Art Underground, hosted by Paula Zahn, premieres Wednesday, June 27 at 7 p.m. on WLIW21 and Thursday, July 5 at 8:30 p.m. on THIRTEEN. 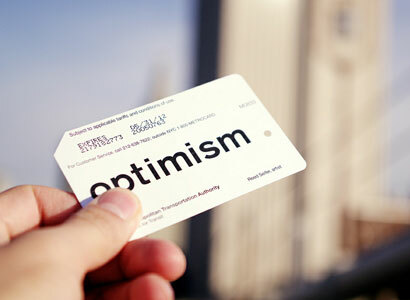 What inspired your “optimism” artwork, and how did the project translate into the optimism MetroCard? In college at Clark University, I did a project where I presented a poem I’d written about optimism on a can of soda, which had been designed to look like it was a brand called “Optimism.” As part of the project I made buttons that had the logo from the optimism soda can printed on them, and I distributed 500 around campus. People went crazy over them, and the buttons took on a whole other asset of art that I had previously not considered. I learned so much about the interaction between what I was creating and the people who were receiving them, and what art could really do to people — it’s profound. When I moved to New York, the director of retail for the Whitney Museum bought whatever I had left of the optimism buttons and sold them in her shop. I kept on making them, particularly after 9/11. At this point I’d had 30,000 optimism buttons so I had quite a few ideas for doing a public art project. I went to see the folks at Creative Time, a public arts fund, and they had an open critique session where artists could come and talk to them for feedback. I came to them with all these different ideas and when I proposed this idea of integrating my optimism project into the subway system, they were really excited and gave me the contact information for the MTA. What response did the cards get from New Yorkers? I would say they got a very New York-like response in that everyone that became aware of the cards had something to say about them. I accept all praise and criticism of the project because I understand that the context in which it exists is actually controversial – – it’s possible to read into the connection between the MTA and optimism. The critical response sometimes was, “What is this doing on the back of my MetroCard when my train never comes on time?” So that was a component that I acknowledge. There was a lot of discussion about that, and to me it was frustrating as an artist, because I wanted to talk about what the project is rather than just where it exists. But many people did see it that way, when people reached out to me directly, it was entirely complimentary in sharing how this was inspiring to them. There really were those emails where people said “I was having the worst time of my life and I didn’t know if I could go on, and then I saw this sign on the back of the MetroCard and I knew it was a sign that I should do what I was thinking of to change.” I would say I’m a sign-maker and I like making signs for other people, so if someone’s looking for a sign I’m happy to provide it. Can you talk about the timing of the card? Why was 2009 an ideal time for this message? Reed Seifer’s optimism MetroCard. Photo by Alex Kwong. I don’t think it’s too often I can say the recession was on our side. As I came to know through the process of doing this project, that when one thinks about public art on the grand scale – we’re talking about 30 million optimism MetroCards – there are so many people involved with these projects, and they are such huge undertakings of both creativity and diplomacy and patience. So, in retrospect the time between when I introduced this concept to MTA Arts for Transit and when it came to be released to the public was actually not that long. I’m more familiar now with public art projects and know that they can go on for 30 years before they come to fruition. I think the state of the world and the state of New York at that time let it be released in a way that would be most well received. I believe my job as an artist is to make the world a better place. Even momentarily, subliminally, to place something in someone’s unconscious, holds the possibility of having an ultimate effect. To have a word on the back of something that people see everyday for a millisecond that they’re not taking full acknowledgement of visually; it’s really potent and powerful. I think in contrast to what was going on in New York, it was just a good time to send that message out. The optimism MetroCard is an example of art in an unexpected place. Do you see any missed opportunities in the city where this kind of artwork could work? I think there are so many opportunities in New York for public art; it’s an exceptional canvas. Art can exist in so many forms, so I always admire artists I see working on the streets. One artist, Madelon Galland, would find areas of the city where the trees had been chopped down and she would upholster the stump of the tree so it was like a little chair. There’s also another artist, Space Invader, who makes little creatures out of mosaics that appear in random spaces around the city. Now that I’ve done this project I really keep an eye out even more so for artists doing similar things. Do you have any favorite subway art? Some of my favorite things I see while I’m waiting for the train is graffiti on top of advertising in the subway stations. Now that I live in Brooklyn, one canvas I notice that interests me is around some trees on the streets, they have a little wall, like a tree pit, to enclose the garden. I think that’s a great space to for public art. I really love the Tom Otterness sculptures that are at the 14th Street A,C,E station – they remind me of my own work in that they can be read on many levels and they appeal to almost everyone. A seven year old would find as much delight in it as a 70-year-old professor, potentially. They are an example of art in an unexpected place as well. Also, on the L,G stop by Metropolitan and Lorimer, there are mosaics on the walls of the station by Jackie Chang that basically take apart words and break them down into new meanings. One of them is the word “useless” that she divides up into “use” and “less” and “mankind” into “man” and “kind.” I find those really engaging, because they allow the audience to interpret them on many levels, like the optimism MetroCard.